Kiran Bedi has started a new web site: SaferIndia.COM. You can register complaints if there was police inaction. She told reporters that police officials were misleading the media and citizens by manipulating crime statistics. "They never give you the right picture. Not even a single police officer has dared to reveal the correct crime graph." She also said that police officials were not addressing complaints from people, and by refusing to probe criminal cases were actually encouraging criminals. You can also use the complaint registered in the saferindia.com site as the legal document in case of filing a case in the court of judgment. Kiran Bedi is an Indian social activist and a retired Indian Police Service (IPS) officer. She became the first woman to join the Indian Police Service (IPS) in 1972, and was last posted as Director General , BPR&D (Bureau of Police Research and Development, Ministry of Home Affairs). She retired from IPS in December, 2007, after taking voluntary retirement. During her service, she was also the Inspector General Prisons of Tihar Jail, - one of world's largest prison complexes, with over 10,000 inmates, from 1993 to 1995 , and her prison reforms policies lead to her winning, the 1994 Ramon Magsaysay Award. Subsequently, she has founded two NGOs in India: Navjyoti for welfare and preventive policing in 1987  and India Vision Foundation for prison reforms, drug abuse prevention, child welfare in 1994 . In 2007, she applied for seeking voluntary retirement from service, and the application was accepted by the government. Kiran Bedi, one of the most admired and widely known police officers who ever served the Indian Police Force, was born on 9 June 1949 in Amritsar, Punjab state, India. She is the second of the four daughters of her parents, Prakash Lal Peshawaria and Prem Lata Peshawaria. She did her schooling from the Sacred Heart Convent School, Amritsar, where she joined the National Cadet Corps (NCC). She also took up tennis, a passion she inherited from her father, who himself was a talented tennis player. Later, she obtained her B.A. in English (Hons.) (1964-68) from the Government College for Women, Amritsar. She then earned a Master’s degree (1968-70) in Political Science from Punjab University, Chandigarh, topping the University. Even while in active service in the Indian Police, she continued her educational pursuits, and obtained a Law degree (LLB) in 1988 from Delhi University, Delhi. In 1993, she did her Ph.D. from Social Sciences from the Department of Social Sciences, the Indian Institute of Technology, New Delhi , where the topic of her thesis was 'Drug Abuse and Domestic Violence'. Kiran Bedi won the Junior National Lawn Tennis Championship in 1966, the Asian Lawn Tennis Championship in 1972, and the All-India Interstate Women's Lawn Tennis Championship in 1976 , besides this she also won the all-Asian tennis champion, and had won the Asian Ladies Title at the age of 22. She began her career as a Lecturer in Political Science (1970-72) at Khalsa College for Women, Amritsar, India. In July 1972, she joined the Indian Police Service. On her web site, she states that she joined the police service "because of my urge to be outstanding". She was last appointed as Director General of India's Bureau of Police Research and Development. On 27 November 2007, she had expressed her wish to take Voluntary Retirement from job to take up new challenges in life.On 25 December 2007, Government of India decided to relieve Bedi, who was holding the post of the director general of Bureau of Police Research and Development, from her duties immediately. After retirement Kiran Bedi launched a new website, www.saferindia.com, on January 3, 2007. The motto of this website is to help people whose complaints are not accepted by the local police. This project is undertaken by the non-profit, voluntary and non-government organisaton, India Vision Foundation. ^ Official website Tihar Prisons Abou us at tiharprisons.nic.in. ^ Kiran Bedi Biography 1994 Ramon Magsaysay Awardee at rmaf. ^ a b c d Kiran Bedi Celebrities at nilacharal. ^ a b A Kiran Bedi:Tough Lady In All Male Bastion Kiran Bedi at living.oneindia. ^ What made me join the IPS? ^ Interview with Kiran Bedi Un Chronicle, January 2003. ^ Indian Heros Kiran Bedi at iloveindia. ^ First female police officer BBC News, Delhi, Tuesday, 27 November 2007. ^ Tihar Jail reforms... goodnewsindia, July,2001. 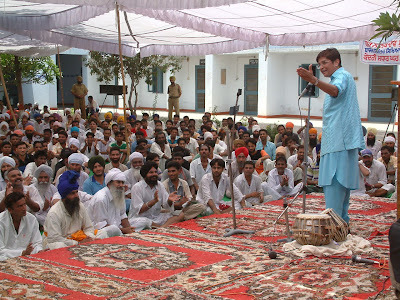 ^ a b Kiran Bedi Indian Personality at indiavisitinformation. ^ Kiran Bedi's profile The Hindustan Times, July 25, 2007. ^ Kiran Bedi's portal clicks with Netizens The Times of India, 13 Jan 2008. ^ "I'M HERE TO DO MY BEST FOR THE DAY" Life Positive, December 1998.